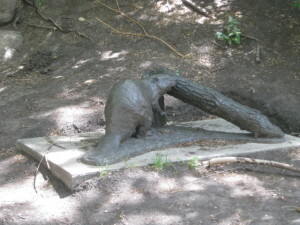 Location: Beaver Hills House Park at 105 St. and Jasper Ave. Go northeast through the park and you will find a life size cast bronze beaver and fallen tree by the pond in the shade. Biography: Don Begg first studied bronze casting and sculpture in Alberta and California, followed by specialized training in monumental sculpture in New Jersey and New York. World-renowned for his public monuments and sculptures, Don Begg has been sculpting at Studio West since its founding in 1970. His popular public art attractions have won numerous public art commissions and awards and can be seen throughout Canada, United States, Germany and France.